The psoas muscles (major and minor) are the only muscles to join the upper body with the lower. The left and right psoas join the lumbar spine to the femur, thus joining the upper body with the lower body. This is quite a special function: think spiritually for a moment and the concept of linking the higher self with the earthy presence. The psoas meeting point is at the diaphragm at T12 or L1 (it can vary) and this junction in the body is known as the solar plexus. This area, a nerve network, is related to those ‘butterfly’ feelings we can get when we are nervous or excited. It is remarkable that the psoas muscle is also linked to the diaphragm and thus our breath, and those feelings which can effect the frequency of our breath such as nervousness, anxiety, excitement. The psoas is one of the main muscles affecting the lower back, so with any lower back pain its condition warrants attention. Because of its deep central position, its closeness to our ‘gut feelings’ and our internal viscera, emotional tension can manifest in the psoas creating debilitating back pain and stiffness. If you suffer with lower back pain, ask yourself: do I feel supported in life? Am I worried/anxious/frightened? Is there a change forthcoming? Working through emotions is a key factor in dealing with back pain caused by the deep psoas, as well as finding the right balance of quality of motion and flow without restriction. 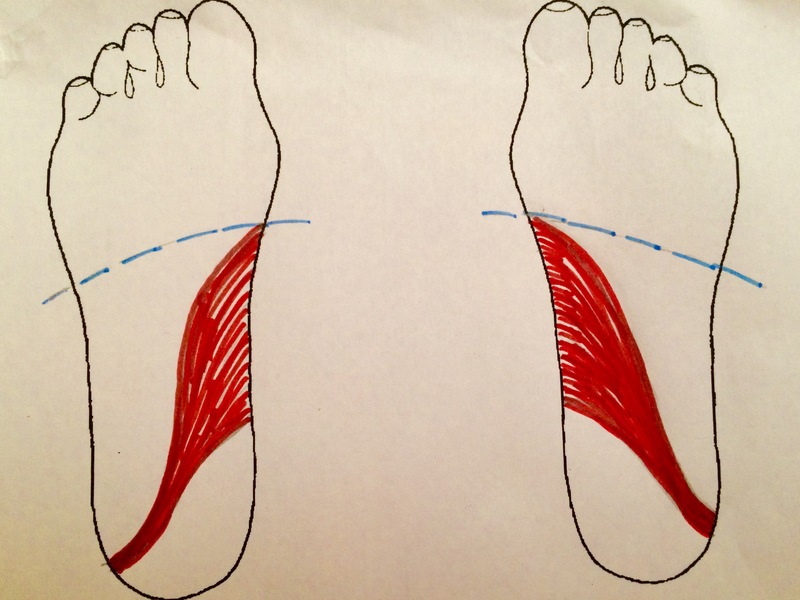 It is interesting to map the psoas muscles on the foot from a reflexology viewpoint. You can see that the psoas covers the medial arch of the foot, which is hugely important in supporting and maintaining posture and gait. It covers a very large area of the foot which only highlights (in my opinion) of its huge importance in our lives, providing support in a physical, mental and spiritual perspective. If you suffer with lower back pain, why not try reflexology or self-treat by massaging the area in red shown on the foot map? I have been on a personal journey with this muscle. Emotional tension building up this year put me in a debilitating situation with such terrible back pain and restricted motion. It was only when discovering the psoas muscle and its functions and representations did I manage to heal myself and come through the dark and into the light. Jackie Marsden MAR is a qualified reflexologist, promoter of healthy living and independent consultant (Team Leader) for Neal’s Yard Remedies Organic. Jackie leads and mentors a growing team of consultants (many of whom are therapists integrating organic products into their existing businesses) via the NYRO social selling channel, holding regular team meetings, one-to-one coaching via phone and facetime, and a closed facebook group. All views are my own.